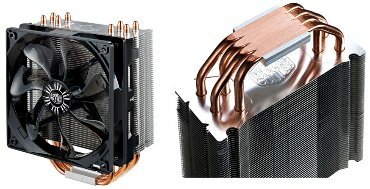 Cooler Master introduced the Hyper 212 EVO, a new CPU cooler with four direct-touch heatpipes, aluminium fins and a 120mm PWM fan. It will ship this month for $34.99. Cooler Master, an industry leading chassis, thermal solution, peripheral, and accessory manufacturer, signals the rebirth of a household name in computing, the Hyper 212 EVO CPU Cooler. It comes packed with an improved tower fin design, heat pipe layout, and upgraded fans and fan brackets that provide an even more extreme value for end-users of all types.